Thank goodness there won’t be any more of these turgid, laborious, and insufferably awful movies that stretch the loose definitions of cinema. 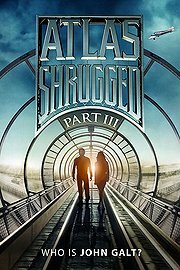 Atlas Shrugged Part III concludes a storyline that did not need the bloated, Peter Jackson-style treatment. Mostly because after four hours, the series still fails to justify its film existence. The production values are pretty low, the storyline consists of robotic characters spitting out ideologies rather than dialogue, and the romance between Dagny (our third actress playing the part) and Henry Reardon, which was a focal point for two movies, is casually brushed aside so Dagny can swoon with the mysterious John Gault. The needless subtitle for the film is “Who is John Gault?” and the answer is an innovator who invited the world’s richest CEOs to escape to a magic kingdom of their own. Analyze that hilarious reality. It’s an island of the 1%, but what does being experts on derivatives do when it comes to individual survival in the wilderness? Do these people plant their own vegetables, build their own homes, or do the menial labor they are not accustomed to? Where did they get the materials for all the goods for this libertarian paradise? Nothing about how this world operates makes sense. If the government, set up to be nefarious and inept, was concerned about Gault why can’t they find them with their wealth of spy resources? The entire Atlas world, transported to a near future that still relies heavily on logistics of the past, strains credulity, from the rise of rail to the idea that a copper shortage is crippling the country’s power supply. This is the kind of film where the good guys (business elites) dress in plaid and drive pickups, whereas the bad guys (government) wear suits and smoke and drink in darkly lit restaurants. This is the kind of movie where “Project F,” a nefarious torture device created by the government, is literally nothing more than a glorified car battery. Then there’s the climactic moment when Gault becomes a full-fledged messianic figure, something in sharp contrast with author Ayn Rand’s views on religion. In fact, Jesus is a prime example of self-sacrifice for the benefit of others, which conflicts greatly with the Randian viewpoint that selfishness is all humans should seek. The entire film is about cognitive dissonance, from the characters, the filmmakers, and Rand herself. Posted on February 16, 2015, in 2014 Movies and tagged bad movies, book, indie, politics, sci-fi, sequel. Bookmark the permalink. Leave a comment.